School District No. 85-2001 in Thayer County, also known as Bruning-Davenport Unified School District was formed in June 2000 by the merging of Bruning Public School and Davenport Community Schools. The combined district covers approximately 176.7 square miles and has a valuation of $190,017,013 (2000). Bruning houses the high school, pre school ages 3 & 4, Kindergarten and 1st grade, while the Davenport site has grades 2-8. District office is at Davenport. The mission statement for the Bruning-Davenport Unified School District is, "To prepare today's students for tomorrow's society by providing opportunities to learn in a safe environment where students are recognized as valued individuals." While the one-room school known as Davenport Community Schools was established in 1878, the present building was completed in 1958 and an addition in 1978. Facilities include two gymnasiums and four locker rooms, a weight deck, a music room, and industrial classrooms, in addition to the K-8 academic facilities. It is a one-level, handicapped-accessible building. In 1998, a long-distance learning room was added, which is also available for public use. Through the use of fiber optics, two-way voice and video communications can take place with 59 other schools and colleges in southeast Nebraska. Students are encouraged to take college courses from Peru State College or Beatrice Community College, for which Bruning-Davenport Unified School currently pays tuition. Our Action School Improvement Committee’s recommendations resulted in an expanded curriculum through unification and sharing of classes and staff with Bruning Public School. The curriculum offers a balance of vocational and college prep courses. Students at B-D USD have a wide variety of extra-curricular opportunities. 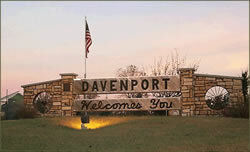 In 2008, the Davenport speech team won their 4th straight title as D-2 State Champions, and Runner Up in 2009 & 2010. In 2002 and 2006 the Boys' basketball team qualified for the State basketball contest. The 2005-06 8-man football team won state. Over the years, success has been evident in drama, music, and athletics. Active Middle School students' emphasis is on the exploratory programs which are based on a middle school educational philosophy. A Bruning-Davenport Unified School graduate will have a well-rounded background. For more information, contact them at 106 N Juniper, P. O. Box 190, Davenport, NE 68335, phone 402-364-2225, fax 402-364-2477, or at 340 Carroll St. Bruning, NE 68322, phone 402-353-4445. Informatioon on both schools plus calendars, lunch menus, etc., may be seen at www.bruningdavenport.org.